Last year Atlanta International captured its first ever state title in soccer. This year the defending Class A champs haven’t had as smooth a road as they did last season going 16-2-1, but the Eagles still shouldn’t be counted out. At 5-9-1, Atlanta International’s record doesn’t look like much. Heck, they haven’t had a winning record since they started 1-0, but if you delve deeper into the results and schedule, you will find that the Eagles are still prepping for flight. Nine losses? How has AIS been ranked all season long? Well the No. 6 ranked Eagles have gone through a gauntlet like none other. The combined record of the eight teams that have beat them? Try 77-15-12. The Eagles have taken their lumps but have sights set on the playoffs. No. 1 Paideia has handed them a pair of 2-1 losses coming on March 31 and April 12, but AIS recently defeated No. 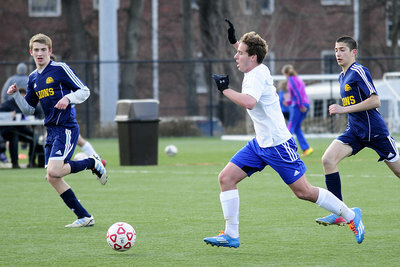 4 Whitefield Academy 2-0 on April 4. The win over Whitefield has been Atlanta International’s only victory over a team with a winning record. They wrap up the season at 3A No. 6 Blessed Trinity with a chance to boost their resume. So the age old question will be put to the test: do good losses make up for a lack of good wins? No team in the state can say they are more battle tested or willing to load the schedule up with tough opponents. Just know that the defending state champions won’t go down without a fight and remain a dangerous team come the state tournament.